While social networks are still just getting their sea legs in most organizations, the next big leap forward — in addition to social analytics — is likely to be the integration of our productivity and line of business apps into our activity streams. Will this unleash significant new value? Very probably. But it’s also possibly the big integration opportunity that businesses have long looked for. Even though the popularity of social networks has grown to the point that it’s a primary way that we engage with each other, just like e-mail, telephone, or face-to-face conversation, we are still learning to make the most of them. For instance, basic social literacy for achieving good results from social software is still in its infancy, such as the open work mindset I explored in my last post. There is a similar lack of experience in connecting social collaboration with enterprise software. How social media relates to the myriad systems of record that we have in the workplace or in our personal lives is another significant question. For example, we do most of our work in an array of individual software applications. Afterwards, we apply tools like e-mail to connect the thread of the work process back together with our co-workers and customers. Like software mashups attempted to address a few years ago, we instinctively know that there should not be a contextual gap between our individual use of applications and the overall work process we’re engaging in. In other words, though we use apps pervasively to accomplish work outputs we often have to provide most of the effort to put the pieces together into something that makes sense. We have to gather information together (or point to where it lives), and then document what it means or engaging in the work process somewhere else. In today’s increasingly connected and inherently narrated social world, this no longer makes much sense. Example: Take a customer service problem, where there many different IT systems that might need to be consulted and the results brought together to achieve a picture of the problem. These might be CRM, payments, shipping, internal experts, troubleshooting databases, document repositories, internal Web sites, and so on. Today, the discussions with co-workers as well as the work in most of these systems would not be connected together into a coherent work stream (or at least, in a limited fashion through point-to-point integration) since there is no easy way to do it using individual systems of record. Wouldn’t it be useful (more efficient, productive, cost effective, etc.) if we could just work in the context of the process at hand? Better yet, what if the work in the relevant apps was accomplished right in the activity stream? And since we’re using social networks to collaborate and work together throughout the day building up crucial narrative and context, doesn’t it make sense that the relevant applications work there too, with us? In fact, as many of you know, this isn’t exactly a new story. Placing applications into social networks was old hat for early adopters years ago. it’s long been central enough that an entire cottage industry has risen up to develop, or adapt, software applications to run within social networks, at least in the consumer world. Many of us have used Farmville (or more appropriate to this conversation, the increasingly popular social business capital app BranchOut), but don’t necessarily connect the dots that these widely used services demonstrate application experiences seamlessly and directly into our social activity streams. Related: What Do Social Business Approaches Offer The Workplace? Facebook has long had hundreds of thousands of applications that it runs that run the gamut from money management to gaming. 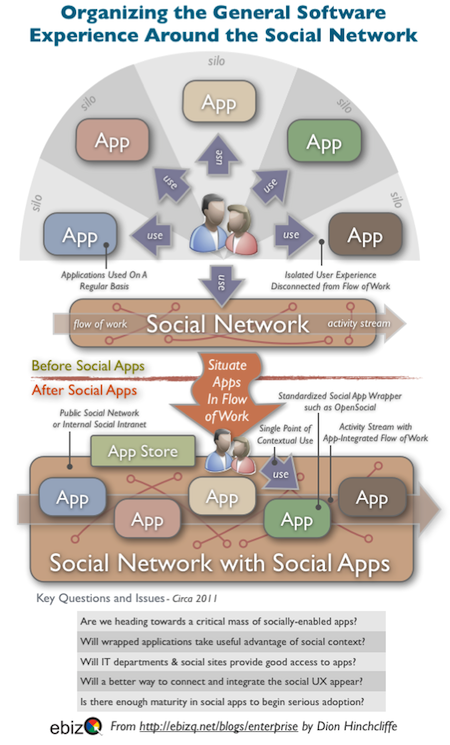 Now the same is now steadily becoming true with enterprise social networks. I would even go so far as to say that a confluence of trends has emerged that’s closely worth watching in the coming months as some of the first serious enterprise social app capability hits the market over the summer. The first is the recent improvements in standards-based social application wrappers, such as the new additions to OpenSocial. As I explored in detail in the post, the mechanics and features have matured to make social apps useful and productive, including search, mobile support, and embedded app experiences. Admittedly, this is speculative, but much less so when combined with the next two developments. The third is that a growing number of enterprise software vendors are finally delivering their apps in a way (again often OpenSocial) that is compatible with social networking products. While the number is still small compared to the number of consumer apps (and will never be as large), it’s not only a significant number but now growing at a reasonable rate to somewhere between one and two thousand by my count (simple formula: sum up Salesforce App Exchange apps, Jive Apps Market, IBM solutions directory, and OpenSocial apps with at least some business utility). I remember reading a great post on Facebook and how they doing just this, also they obsess about running their business on four or less touch points. My name is Ali and I am BranchOut’s Community Manager. I wanted to reach out and introduce myself, and thank you for using BranchOut! We loved your insightful article, thanks for including us. I started following you on Twitter so I look forward to staying in touch. I see activity stream more as an opportunity to integrate information from different business apps you use and create one flow of work. But still doing the work would be much easier to be accomplished inside the app itself that was tuned towards this work. Let’s say you are software product manager and you are trying to mock-up the screens for your product. Even though it would make a lot of sense to get any information updates related to your tasks into your activity stream, you would still like to do mockups inside the tool like Balsamic. Actually the analogy of Farmville you bring proves the same. You get notifications from your friends into your feed, but you are not playing inside the feed, instead you open Farmville app for that.